Connecticut 2012 NAIP Color Orthophotography is a statewide aerial survey of 2012, natural color, leaf on, 3.39 feet (1 meter) ground sample distance imagery for Connecticut from the National Agriculture Imagery Program (NAIP). NAIP acquires digital ortho imagery during the agricultural growing seasons in the continental United States. A primary goal of the NAIP program is to enable availability of ortho imagery within one year of acquisition. NAIP is administered by the USDA's Farm Service Agency (FSA) through the Aerial Photography Field Office in Salt Lake City. 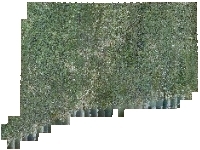 This leaf-on imagery is captured during the peak growing season and is used as a base layer for GIS programs in FSA's County Service Centers, and is used to maintain the Common Land Unit (CLU) boundaries. The ground resolution for this imagery is 3.39 feet (1 meter) per image pixel. 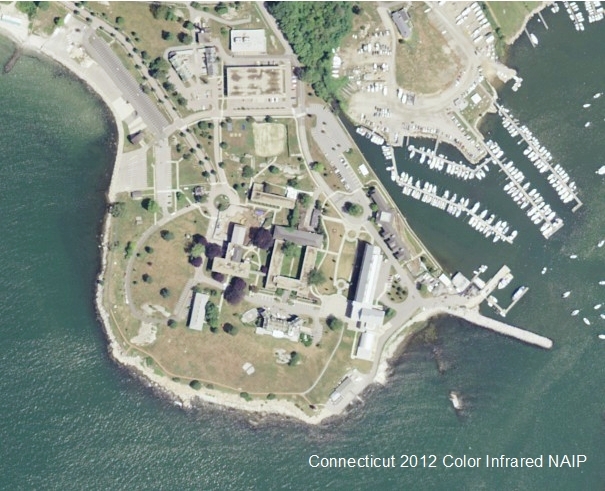 The 2012 NAIP imagery for Connecticut includes 4 color bands, allowing for the display and analysis in natural color or color infrared. The nearby example is in natural color. This leaf-on, natural color imagery serves a variety of purposes from observing vegetation and crop condition to supporting identification and mapping of habitat areas through photo interpretation. This orthophotography is ideal for observing crop condition. This statewide mosaic of 2012 orthophotography is not color balanced so tonal imbalances between individual input images are not corrected. As shown in the nearby example, the range and intensity of colors varies depending on the area viewed. For example, surface water bodies and and trees in the natural color imagery appear in different intensities of blue and green across the state. Because the 2012 aerial photography was taken during the peak agricultural growing seaon, the tree canopy blocks the ground surface from view and creates shadows that also obscure nearby features. Also, the location and shape of features in other GIS data may not exactly match information shown in the 2012 aerial photography primarily due to differences in spatial accuracy and data collection dates. For example, a stream in the 1:24,000-scale Connecticut Hydrography data from CT DEP may not line up exactly with the watercourse shown in the 2012 aerial photography. Their location and shape are bound to be different because information such as hydrography compiled from older 1:24,000-scale USGS topographic quadrangle maps, lacks the spatial accuracy of and is less current than the 2012 orthophotography. Status - Orthophotography covers the State of Connecticut. Date of Data - Summer 2012. Depending on the area, photography was captured in 2012 on July 6, 12, 21, 25, August 7 and 17. Map Scale and Accuracy - The ground resolution for this imagery is 3.39 feet (1 meter) per image pixel. GIS Metadata - Contains technical documentation describing the 2012 NAIP Color Orthophotography data and the data sources, process steps, and standards used to collect and store this information in a geographic information system (GIS). Connecticut 2012 NAIP Orthophotography data is available from DEEP GIS Data. Connect GIS and AutoCAD software to this information online using the Ortho 2012 4Band NAIP CT ECO Map Service.